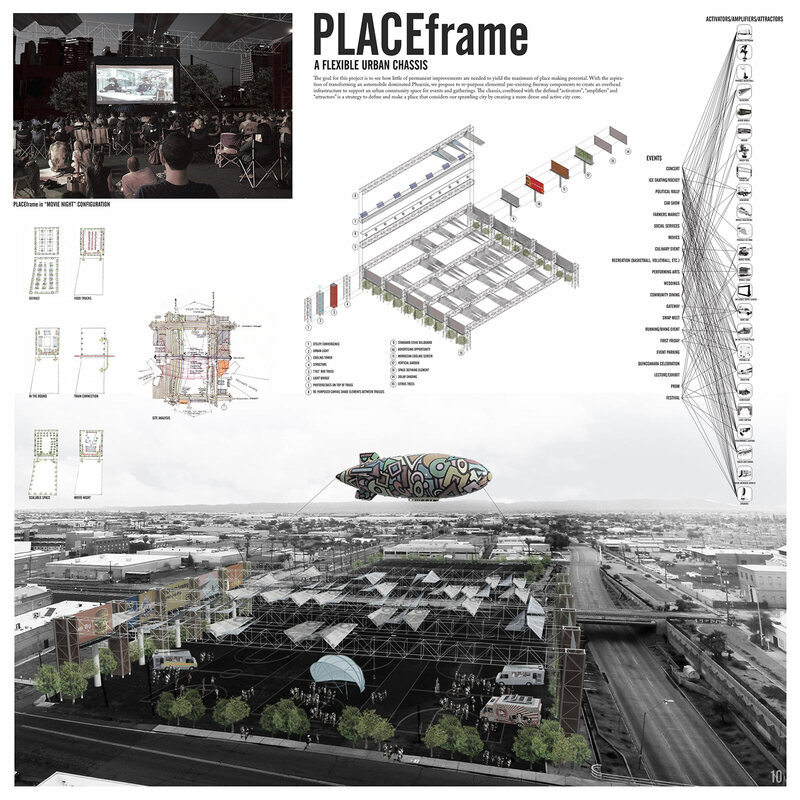 “Make a Place” ​was a design competition put on by AIA Phoenix that asked entrants to formulate an innovative program for a theoretical project on a site located in Downtown Phoenix in the Warehouse District between Central Avenue and 1st Avenue, south of Jackson and north of Buchanan. This entry was produced by Eric Sterner and John Kane of Architekton. The idea that urbanism and place making doesn’t happen overnight, coupled with the site’s inherent perceived issues: fringe location, bounded by surface (and sub‐surface) streets, scarcity of housing, and the site being bi‐furcated by railroad tracks, became the inspiration for this proposal strategy. The site places flexible parking (for at least the near future) on the south parcel, due to its connectivity to 1st and Central Avenues. The north site becomes the actual “Place.” The long‐term objective is to create a permanent flush crossing over the tracks. An advantageous pedestrian underpass already exists as at temporary solution, as these types of transitions take time to establish and evolve. The goal was to see how little of permanent improvements are needed to yield the maximum of place making potential. With the aspiration of transforming an automobile dominated Phoenix, we propose to re‐purpose freeway sign box trusses to create an overhead infra‐structure. With a minimal footprint, this chassis becomes the skeletal backbone that begins to define the space above the north site. The truss columns that support the box trusses integrate evaporative cooling towers for summer cooling and fireplaces for winter heating. The columns are clad in polycarbonate and internally illuminated to capitalize on the gateway nature of the site. Also along the east and west boundaries, re‐contextualized freeway billboards further define the volume while helping to mitigate the harsh east/west sun angles. Citrus trees are the final permanent elements that provide additional low angle shade, evapo‐transpirational cooling, food for the indigenous homeless population and to help begin to create a pedestrian friendly interface. An urban nursery of an additional 50 boxed trees are integrated into the parking configuration to provide shade and reduce heat island effect. The boxed trees can be used to adjust the scale of the event space using forklifts. With the sites innate connectivity to the city’s relentless Cartesian grid of roads, a wide range of mobile “activators” can easily be brought to the site. With the existing paving as a universal surface, food trucks, mobile band shells, social service vehicles and others, can be combined and composed in unlimited arrays. “Amplifiers,” such as reusable modular overhead shade canopies, mobile public toilets, lighting instruments, sound systems and the like can be integrated and “right sized” to enhance the venue. “Attractors” such as airships, searchlights and social media can be used to generate excitement about upcoming and “live” events. This resulting alchemy of elements and components yields an opportunity to create an authentic and real place over time. This proposed strategy involves minimal investment, while providing a valuable and flexible open air urban place for Phoenix. As times change and the activities and technologies that bring people together also change, it is critical to create venues that can physically and economically adapt easily with those changes to support the sense of place that helps to define our City. The area between Central Avenue and 1st Avenue, south of Jackson and north of Buchanan. This is an envisioning of the possibilities of this location, and is by no means a project that is planned or overseen by the site or property owners. With these hypothetical projects, we hope to spark a conversation to help imagine the city's future, and our ideas do not reflect actual plans.